Facebook really wants you to make it "FB official", send your loved one a ton of cascading hearts, communicate in heart-eyes emoji, and keep tabs on your partner's availability to chat. It's almost as if Facebook has a fundamental misunderstanding of how people are using its platform. 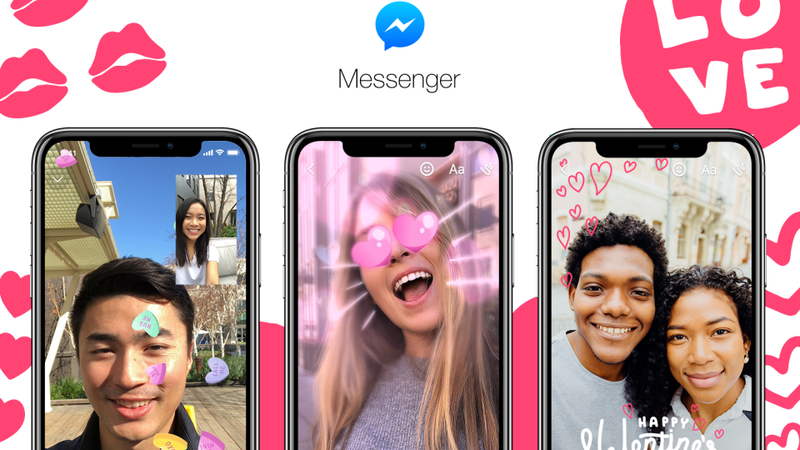 The social network announced today that it is rolling out a few updates to Messenger, but you'll only see them "if you newly indicate you're in a romantic relationship on Facebook (AKA make it 'FB official')". Or what I like to call, the kiss of death. A Facebook spokesperson confirmed in an email to Gizmodo that the features will only be available to users who indicate they are in a relationship tomorrow (Valentine's Day in the US) and afterwards. Users who change their relationship status will get a notification on Messenger that will open up a chat with their significant other. The features available to them include "a heart shower" that will cascade down their screen. Users will also "be prompted to personalise" their chats by choosing a "custom text colour, emoji, and nickname". Lastly, in a bullet point labelled "Chatting with bae", Facebook noted that your significant other will be first to show up in the Messenger Active tab. These are exasperatingly gimmicky features, compounded by Facebook spamming you with another nudge to use its messaging service. What's more, it's painful to see Facebook dust off "FB official" - a saying that's getting up there in years - and try to bring it back. It's unlikely users want the social network to be even more invasive and cringeworthy about their relationships. Romantic gestures exist more and more online, sure, but to believe they look like an inundation of heart animations is a deeply outdated conviction. It's almost as outdated as believing users want to declare their love by handing over more information about their interpersonal lives to tech giants.